In light of Congress’ work towards reauthorizing the Higher Education Act (HEA), Results for America, Knowledge Alliance and America Forward hosted an event on March 22 about the role that data and evidence can play in improving student outcomes in higher education. This event also came after Results for America released their bipartisan report, “Moneyball for Higher Education,” which outlines recommendations for how state leaders should use data and evidence in the financing of colleges to improve student outcomes. The event began with remarks from U.S. Representative Grace Meng (D-NY) about the importance of evidence and innovation in higher education. Meng discussed the City University of New York’s (CUNY) Accelerated Study in Associate Programs (ASAP), which provides financial, academic and financial support to assist students in earning their associate degrees within three years. Meng highlighted the data-driven nature of ASAP, as the program tracks metrics that include advisors’ contact with students and student outcome trends to determine what is working in the program and where improvements can be made. While ASAP costs CUNY more per student initially than students not involved in ASAP, by graduation, CUNY spends less per ASAP student compared to students not in the program because the students in ASAP graduate at a faster rate than students not in ASAP. Graduation rates for students in ASAP have increased to 40 percent, compared to 22 percent for CUNY students overall. The event ended with a panel that featured experts in the field of education and data analysis. James Kvaal, the President of the Institute for College Access and Success, outlined what he would like to see come from a reauthorized HEA: investing in ways to measure critical outcomes, sectioning off one percent of the higher education budget for evaluation and systemically channeling resources into programs that work. Michael Weiss, a senior associate from MDRC, mentioned the need for more comprehensive, long-lasting interventions, such as the ASAP program, that address multiple barriers to education across an extended period of time. The panel concluded with the panelists discussing what they would change about the education system. Greg Johnson, CEO of Bottom Line, advocated tying Pell grants to an advising requirement. Kvaal emphasized the importance of colleges deciding what outcomes they want to produce and then investing the necessary resources so that those outcomes can come to fruition. Weiss expressed his desire for the use of a funding model that would allow for experimentation on the lowest level and an investment in data driven programs like ASAP on the highest level. While the panelists recognized that the current education system is inequitable and touched on ways that data can be used to improve student outcomes in higher education, it would have been great to hear more on how data could be used to align labor market needs with student outcomes, as well as how data from the secondary system can be used to create higher-quality postsecondary programs. Oregon closes out its legislative session with a number of Career Technical Education (CTE) related bills and Ohio make a decision on a measure of studentsâ€™ early college and career readiness. Oregon passed HB 2912 requiring representatives from the Department of Education, the Department of Community Colleges and Workforce Development, and the Bureau of Labor and Industries to meet at least four times each year to promote collaboration between the agencies on issues related to career technical education. 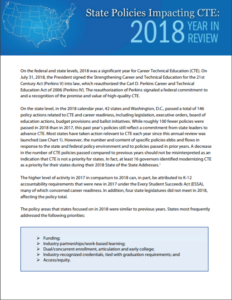 The Advisory Committee is tasked with making sure CTE programs are available in public schools; developing regional centers that create partnerships between K-12, community colleges, public universities, and business/unions; encouraging the establishment of local advisory committees; and addressing barriers to CTE students transitioning to postsecondary education and the workforce.Â This bill also establishes the Career and Technical Student Organization (CTSO) Grant Program within the Department of Education, allotted at $500,000 over two years, to encourage student participation in CTSOs. Oregon also established an Accelerated Learning Committee, comprised of the Chief Education Officer and appointees selected by the Governor, President of the Senate, and Speaker of the House, and charged with examining methods to encourage and enable students to earn more college credit while enrolled in high school. The focus will be on the alignment of funding, assessments and policies between high schools and institutions of higher education. SB 222 also requires every community college district to implement and make available at least one two-plus-two, dual credit and/or another accelerated college credit program to every K-12 district within their community college district by 2015. Lastly, Oregon created a STEM Investment Council via HB 2600 to help develop and oversee a long-term, statewide science, technology, engineering and mathematics (STEM) strategy. The council will consist of nine members from the private sector to be appointed by the Chief Education Officer to aid and advise the Superintendent of Public Instruction, the Commissioner for Community College System and the Chancellor of the Oregon University System on policies and programs, including the STEM Investment Grant Program. This new grant program will provide funds to districts, community college districts, public universities, relevant state agencies and any combination of these eligible recipients to support STEM education inside and outside of the classroom. The legislation notes that a STEM Investment Grant Account will be established in the State Treasury, separate and distinct from the General Fund, but no amount is noted or appropriated in this bill. Double the number of students who earn a postsecondary degree requiring proficiency in science, technology, engineering and/or mathematics. The Ohio Department of Education, in partnership with the Ohio Board of Regents, has officially selected the PSAT as the statewide â€œcollege-career readiness assessment.â€ Beginning in October 2014, all sophomores will be required to take the PSAT. The goal of this policy is to provide information to students earlier about their readiness for postsecondary-level coursework so they can adjust accordingly while still in high school. Jobs for the Future released What It Takes to Complete High School: A Shifting Terrain of Course and Diploma Requirements, a policy brief describing trends in statesâ€™ graduation policies (which NASDCTEc has begun tracking here, here, and here). Enact policies that assist all students to develop knowledge of career pathways leading to specific occupations and to have a personal career plan with flexible career goals. 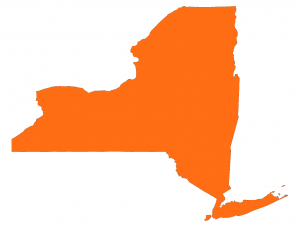 The New NY Education Reform Commission recently released recommendations for an initial Action Plan to improve student achievement in the state. Among the nine preliminary recommendations included in the report was a proposal to expand Career Technical Education (CTE) in order to bridge the gap from high school to college. â€œNew York should leverage existing resources and public-private support to establish high tech CareerÂ and Technical Education programs in every region.,â€ according to the report, which was written by the 25-member commission. New York business owners reported to the commission on the significant gap in workforce preparation in schools and on their own readiness to collaborate with the schools to better prepare and serve students. The commission is expected to convene in the fall to expand on the recommendations. As I have traveled the country, one of the most common questions I get is about how NCLB highly qualified teacher (HQT) requirements impact CTE. 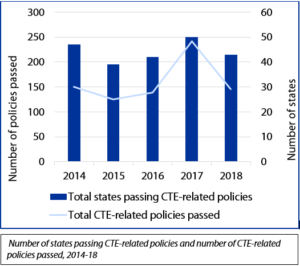 NCLB statute and regulations do not require CTE teachers to meet the same requirements as academic teachers, in large part because so many CTE teachers come from industry and through alternative routes. 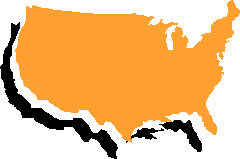 States some latitude to define what highly qualifed means for CTE.Â However, the HQT regulations related to academic teachers have had the unintendend consequence of limiting states’ ability to allow CTE courses to garner academic credit because if academic credit is awarded then the teacher teaching that class must meet academic HQT requirements.Â Several states have developed innovative approaches to this challenge. Idaho invested in funding to CTE teachers certified in academic areas. New York negotiated a waiver to allow academic and CTE team teaching (strictly regulated) to meet the requirements. 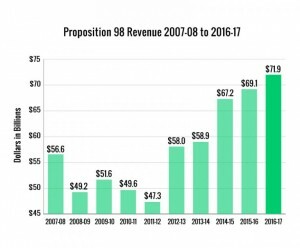 California is the latest state to offer up another option given challenges districts are facing due to tough economic times. 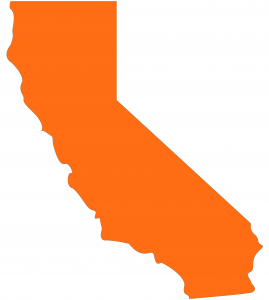 With districts looking for creative ways to address staffing needs, the California Department of Education issued advice this week reminding local educational agencies that a career technical education instructor can qualify as a â€˜highly qualified teacherâ€™ with authorization from the school board. The issue has been raised repeatedly by districts that are struggling under the current budget crisis to match diminishing instructional resources with ever growing student needs and still meet federal goals under the No Child Left Behind Act. â€œAmid massive layoffs throughout the state, people are trying to save their jobs and find out what they are credentialed for,â€ said Lynda Nichols, NCLB coordinator at CDE. â€œWhen a district decides to have one of these classes and the board approves it as a graduation requirement, it throws the non-NCLB course into NCLB [requirements].â€Â The California Commission on Teacher Credentialing said that if a school is granting graduation credit for a CTE class, then the instructor need only carry a CTE credential. To qualify as a â€œhighly qualified teacher,â€ the instructor must have a four-year college degree and hold a proper credential in their CTE subject area. To be NCLB compliant, a business education instructor that has a single subject or standard secondary credentialed in business education can satisfy the economics requirement and does not need a history-social science credential. The same applies for an agriculture instructor majored in agriculture business or education and credentialed with a single subject or standard secondary in agriculture. A home economics instructor who majored in nutrition, dietetics, or food science with a single subject or standard secondary credential in home economics education can satisfy biological science and does not need a biology science credential. Biology science can also be taught by a health instructor that posses a single subject credentialed in health science education. A home economics instructor with a major in apparel design and merchandising and appropriately credentialed in home economics can satisfy the visual and performing arts requirement. Finally, industrial and technology education teachers majored in either manufacturing technology or industrial technology can satisfy the physical sciences with a single subject or standard secondary ITE credential and would not need one in chemistry or physics science.